The “Expansion of Hong Kong International Airport into a Three-Runway System” (the Project) serves to meet the future air traffic demands at Hong Kong International Airport (HKIA). On 7 November 2014, the Environmental Impact Assessment (EIA) Report (Register No. : AEIAR-185/2014) for the Project was approved and an Environmental Permit (EP) (Permit No. : EP-489/2014) was issued for the construction and operation of the Project. 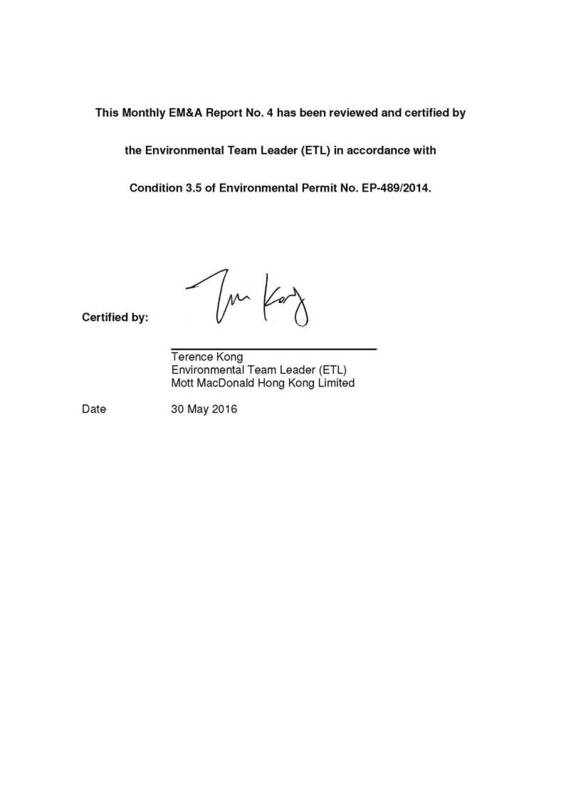 Airport Authority Hong Kong (AAHK) commissioned Mott MacDonald Hong Kong Limited (MMHK) to undertake the role of Environmental Team (ET) for carrying out the Environmental Monitoring & Audit (EM&A) works during the construction phase of the Project in accordance with the Updated EM&A Manual. This is the 4th Construction Phase Monthly EM&A Report for the Project which summarizes the monitoring results and audit findings of the EM&A programme during the reporting period from 1 April 2016 to 30 April 2016. The key construction activities of the Project carried out in the reporting month were related to Contract P560(R) Aviation Fuel Pipeline Diversion Works (Contract P560(R) which involved mobilization and installation of construction plant, installation of horizontal directional drilling (HDD) casing pipe and setup of site office. Dust suppression measures including wheel washing, watering and covering of excavated materials and establishment of site hoarding have been implemented. No construction work was carried out on Sheung Sha Chau Island during the ardeid’s breeding season in the reporting month in accordance with the Updated EM&A Manual. The monthly EM&A programme was undertaken in accordance with the Updated EM&A Manual of the Project. During the reporting period, the ET conducted thirty-six sets of air quality measurements, twenty sets of construction noise measurements, as well as four environmental site inspections, landscape & visual and waste monitoring for the Project’s construction works. 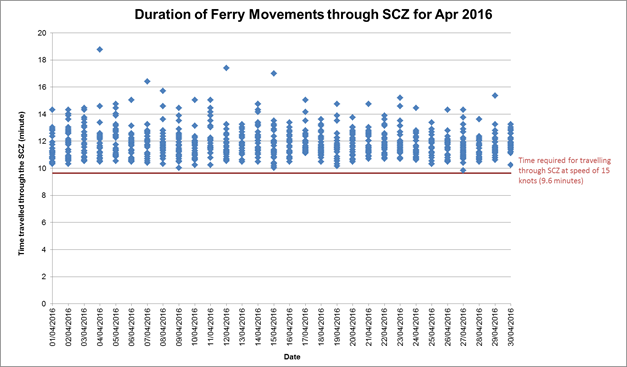 On the implementation of the SkyPier Plan, the daily movements of all SkyPier high speed ferries (HSFs) in April 2016 were within the maximum daily cap number. A total of 805 HSF movements under SkyPier Plan were recorded and all HSFs had travelled through the Speed Control Zone (SCZ) with prevailing speeds under 15 knots (7.7 to 14.7 knots) in compliance with the SkyPier Plan. There were 4 movement cases of not fully following the diverted route and investigation results revealed that all cases were related to safety/emergency situations. One exceptional case was pertaining the HSF had to return to the SkyPier by taking a U-turn without leaving the SCZ through the gate access points and was slightly off the SCZ. In summary, the ET and IEC have audited the HSF movements against the SkyPier Plan and conducted follow up investigation or actions accordingly. All scheduled 1-hour total suspended particulate (TSP), noise and waste monitoring were completed in the reporting period for the relevant construction activities. No exceedance of the Action/ Limit Levels was recorded. ¡ Stockpiling of excavated materials from HDD operation. The key environmental issues will be associated with dust and noise generation, surface runoffs and construction waste management. The implementation of required mitigation measures by the Contractor will be monitored by the ET. No construction works will be carried out on Sheung Sha Chau Island during the ardeids’ breeding season between April and July in accordance with the Updated EM&A Manual. ¡ Baseline water quality monitoring was commenced in April 2016. No exceedance of project-related limit level was recorded. No exceedance of project-related action level was recorded. No construction activities related complaints were received. Neither notifications of summons nor prosecution were received. Remarks: ^ only exceedance of action/ limit level related to Project works will be highlighted. On 7 November 2014, the Environmental Impact Assessment (EIA) Report (Register No. 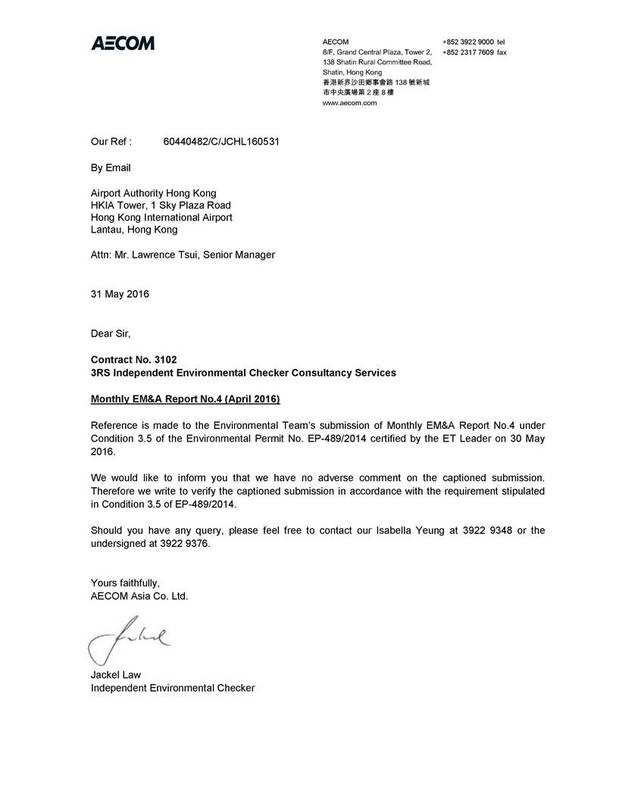 : AEIAR-185/2014) for the “Expansion of Hong Kong International Airport into a Three-Runway System” (the Project) was approved and an Environmental Permit (EP) (Permit No. : EP-489/2014) was issued for the construction and operation of the Project. Airport Authority Hong Kong (AAHK) commissioned Mott MacDonald Hong Kong Limited (MMHK) to undertake the role of Environmental Team (ET) for carrying out the Environmental Monitoring & Audit (EM&A) works during the construction phase of the Project in accordance with the Updated EM&A Manual (the Manual) submitted under EP Condition 3.1. The Manual is available on the Project’s dedicated website (accessible at: http://env.threerunwaysystem.com/en/index.html). AECOM Asia Company Limited (AECOM) was employed by AAHK as the Independent Environmental Checker (IEC) for the Project. The Project covers the expansion of the existing airport into a three-runway system (3RS) with key project components comprising land formation of about 650 ha and all associated facilities and infrastructure including taxiways, aprons, aircraft stands, a passenger concourse, an expanded Terminal 2, all related airside and landside works and associated ancillary and supporting facilities. The existing submarine aviation fuel pipelines and submarine power cables also require diversion as part of the works. Construction of the Project is to proceed in the general order of diversion of the submarine aviation fuel pipelines, diversion of the submarine power cables, land formation, and construction of infrastructure, followed by construction of superstructures. The land-based construction works of the Contract P560(R) Aviation Fuel Pipeline Diversion Works (Contract P560(R)) commenced on 28 December 2015 on the airport island. The overall phasing programme of all construction works and the contract information of Contract P560(R) can be referred to Appendix A of the Construction Phase Monthly EM&A Report No. 1. Any changes/ updates of the construction programme and contract information will be reported in the Monthly EM&A report when necessary. Notably, on 29 April 2016, AAHK received the Chief Executive-in-Council’s approval for draft Chek Lap Kok Outline Zoning Plan, as well as the authorization of the reclamation under the Foreshore and Sea-bed (Reclamations) Ordinance for the expansion of HKIA into a 3RS. This is the 4th Construction Phase Monthly EM&A Report for the Project which summarizes the key findings of the EM&A programme during the reporting period from 1 to 30 April 2016. The Project’s organization structure remained unchanged during the reporting month. The Project’s organization structure and the contact details of the key personnel can be referred to Appendix B and Table 1.1 respectively of the Construction Phase Monthly EM&A Report No.1. During the reporting period, key construction activities of the Project were related to the Contract P560(R) Aviation Fuel Pipeline Diversion Works (Contract P560(R) which involved mobilization and installation of construction plant, and installation of horizontal directional drilling (HDD) casing pipe at the HDD launching site located at the west part of the airport. The excavated materials from HDD operation were stockpiled at the stockpile area located near Chun Ming Road adjacent to Tradeport Logistic Centre on the airport island. Site office setup has been completed at a site near the Chek Lap Kok Fire Station at Catering Road East. The HDD launching site and stockpile area are around 3 km and 900 m away respectively from the nearest air and noise sensitive receivers in Tung Chung and the villages in North Lantau. The locations of the Contract P560(R) works areas and site office are presented in Figure 1. As presented in the Updated EM&A Manual, the environmental aspects of interest for the Project include air quality, noise, water quality, waste management, land contamination, terrestrial ecology, marine ecology, fisheries, landscape & visual, sewage and sewerage, and hazard to human life. The status for all environmental aspects is presented in Table 1.1. The EM&A requirements remained unchanged during the reporting period and details can be referred to Table 1.2 of the Construction Phase Monthly EM&A Report No. 1. The baseline air quality monitoring result has been reported in Baseline Monitoring Report (Version 1) and submitted to EPD on 14 December 2015 under EP Condition 3.4. The baseline noise monitoring result has been reported in Baseline Monitoring Report (Version 1) and submitted to EPD on 14 December 2015 under EP Condition 3.4. The baseline water quality monitoring was commenced in April 2016. The CAR for Golf Course was submitted to EPD on 17 March 2016. EPD had no adverse comment on the CAR for Golf Course on 6 April 2016. The revised Egretry Survey Plan was submitted and approved by EPD on 25 April 2016 under EP Condition 2.14. No construction work was carried out on Sheung Sha Chau Island during the ardeid’s breeding season in the reporting month in accordance with the Updated EM&A Manual. No ecological monitoring was conducted during the reporting month. A pre-construction phase dive survey for corals along the northern and north-eastern seawall of the airport island and at the daylighting location on Sheung Sha Chau Island was undertaken and completed on 29 January 2016. The Coral Translocation Plan was submitted to EPD on 29 April 2016 under EP Condition 2.12. The baseline landscape & visual monitoring result has been reported in Baseline Monitoring Report (Version 1) and submitted to EPD on 14 December 2015 under EP Condition 3.4. Taking into account that the construction works in this reporting month were mainly land-based works of Contract P560(R), the required impact monitoring focused on air quality, noise, waste management and landscape & visual. The EM&A programme also involved weekly site inspections and related auditing conducted by the ET for checking the implementation of the required environmental mitigation measures recommended in the approved EIA Report. The EM&A programme has been following the recommendations presented in the approved EIA Report and the Updated EM&A Manual. A summary of implementation status of the environmental mitigation measures for the construction phase of the Project during the reporting period is provided in Appendix A. Air quality monitoring was conducted at two representative monitoring stations in the vicinity of air sensitive receivers in Tung Chung and villages in North Lantau in accordance with the Updated EM&A Manual. Table 2.1 describes the details of the monitoring stations. Figure 2 shows the locations of the monitoring stations. In accordance with the Updated EM&A Manual, baseline 1-hour total suspended particulate (TSP) levels at the two air quality monitoring stations were established as presented in the Baseline Monitoring Report (Version 1 dated December 2015). Impact 1-hour TSP monitoring was conducted for three times every 6 days. The Action and Limit Levels of the air quality monitoring are provided in Table 2.2. The air quality monitoring schedule involved in the reporting period is provided in Appendix C.
Portable direct reading dust meter was used to carry out the 1-hour TSP monitoring. The brand and model of the equipment are given in Table 2.3.
a. The portable direct reading dust meter was mounted on a tripod at a height of 1.2 m above the ground. b. Prior to the measurement, the equipment was set up for 1 minute span check and 6 second background check. c. The one hour dust measurement was started. Site conditions and dust sources at the nearby area were recorded on a record sheet. d. When the measurement completed, the “Count” reading per hour was recorded for result calculation. The portable direct reading dust meter is calibrated every year against high volume sampler (HVS) to check the validity and accuracy of the results measured by direct reading method. The calibration certificates of the portable direct reading dust meter are provided in Appendix B. The corresponding calibration record of the HVS is also given in Appendix B. The monitoring results for 1-hour TSP are summarized in Table 2.4. Detailed impact monitoring results are presented in Appendix D.
No exceedance of the Action /Limit Level was recorded at all monitoring stations in the reporting period. General meteorological conditions throughout the impact monitoring period were recorded. Wind data for each monitoring day including wind speed and wind direction was collected from the Chek Lap Kok Wind Station. Noise monitoring was conducted at five representative monitoring stations in the vicinity of noise sensitive receivers in Tung Chung and villages in North Lantau in accordance with the Updated EM&A Manual. Figure 2 shows the locations of the monitoring stations and these are described in Table 3.1 below. As described in Section 4.3.3 of the Updated EM&A Manual, monitoring at NM2 will commence when the future residential buildings in Tung Chung West Development become occupied. Note: (1) As described in Section 4.3.3 of the Updated EM&A Manual, noise monitoring at NM2 will only commence after occupation of the future Tung Chung West Development. In accordance with the Updated EM&A Manual, baseline noise levels at the noise monitoring stations were established as presented in the Baseline Monitoring Report (Version 1 dated December 2015). Impact noise monitoring was conducted once per week in the form of 30-minute measurements of Leq, L10 and L90 levels recorded at each monitoring station between 0700 and 1900 on normal weekdays. The Action and Limit levels of the noise monitoring are provided in Table 3.2. The construction noise monitoring schedule involved in the reporting period is provided in Appendix C.
Note: (i) reduce to 70dB(A) for school and 65dB(A) during school examination periods. Noise monitoring was performed using sound level meter at each designated monitoring station. The sound level meters deployed comply with the International Electrotechnical Commission Publications 651:1979 (Type 1) and 804:1985 (Type 1) specifications. Acoustic calibrator was used to check the sound level meters by a known sound pressure level for field measurement. The brand and model of the equipment are given in Table 3.3.
a. The sound level meter was set on a tripod at least a height of 1.2 m above the ground for free-field measurements at monitoring stations NM1A, NM4, NM5 and NM6. A correction of +3 dB(A) was applied to the free field measurements. b. Façade measurements were made at the monitoring station NM3A. c. Parameters such as frequency weighting, time weighting and measurement time were set. d. Prior to and after each noise measurement, the meter was calibrated using the acoustic calibrator. If the difference in the calibration level before and after measurement was more than 1 dB(A), the measurement would be considered invalid and repeat of noise measurement would be required after re-calibration or repair of the equipment. e. During the monitoring period, Leq, L10 and L90 were recorded. In addition, site conditions and noise sources were recorded on a record sheet. f. Noise measurement results were corrected with reference to the baseline monitoring levels. g. Observations were recorded when high intrusive noise (e.g. dog barking, helicopter noise) was observed during the monitoring. a. The microphone head of the sound level meter was cleaned with soft cloth at regular intervals. b. The meter and calibrator were sent to the supplier or laboratory accredited under Hong Kong Laboratory Accreditation Scheme (HOKLAS) to check and calibrate at yearly intervals. Calibration certificates of the sound level meters and acoustic calibrators used in the noise monitoring are provided in Appendix B. The construction noise monitoring results are summarized in Table 3.4 and the detailed monitoring data are provided in Appendix D.
(ii) Reduced to 65 dB(A) during school examination periods. As the construction activities were small in scale during the reporting period and far away from the monitoring stations, major sources of noise dominating the monitoring stations observed during the construction noise impact monitoring were aircraft noise at NM3A and NM5, aircraft noise and helicopter noise at NM6, road traffic noise at NM1A and school activities at NM4 in this reporting month. No exceedance of the Action/ Limit Level was recorded at all monitoring stations in the reporting period. In accordance with the Updated EM&A Manual, the waste generated from construction activities was audited once per week to determine if wastes are being managed in accordance with the Waste Management Plan (WMP) prepared for the Project, contract-specific WMP, and any statutory and contractual requirements. All aspects of waste management including waste generation, storage, transportation and disposal were assessed during the audits. The Action and Limit levels of the construction waste are provided in Table 4.1. Weekly monitoring of the Project construction works was carried out by the ET on 6, 13, 20 and 27 April 2016 to check and monitor the implementation of proper waste management practices during the construction phase. For Contract P560(R) Aviation Fuel Pipeline Diversion Works, recommendations were provided during monitoring including the provision of drip tray and chemical storage area for oil containers on 13 April 2016. The contractor had followed up with implementation of mitigation measures. The P560(R) Contractor was advised to properly maintain a recording system, maximize the reuse of C&D materials and properly maintain site tidiness. Based on the updated information, 1.5 tonnes and 3.94 tonnes of general refuse were disposed of to the West New Territories (WENT) Landfill in late March 2016 and April 2016 respectively. No Construction and Demolition (C&D) material was disposed off-site during the reporting month. No exceedances of the Action and Limit Levels were recorded in the reporting period. Weekly site inspection of the construction works was carried out by the ET on 6, 13, 20 and 27 April 2016 to monitor the implementation of proper environmental pollution control and mitigation measures for the Project. The site inspection on 27 April 2016 was conducted by the ET in the presence of EPD’s inspectors when they visited the Project site. Site inspections were also conducted independently by the Project’s Independent Environmental Checker (IEC) on 13, 20 and 27 April 2016. Observations have been recorded in the site inspection checklists and passed to the Contractor together with the appropriate recommended mitigation measures where necessary. The key observations from site inspection and associated recommendations were related to the improvement of efficiency of wastewater treatment facilities, provision of sandbags along gaps underneath the hoarding and provision of drip tray for oil drum. Dust suppression measures including wheel washing, watering of unpaved site area, covering of excavated materials and establishment of site hoarding have been implemented. The installation of wheel washing facilities at HDD launching site and stockpiling area were completed. Installation of site drainage at the stockpiling area and wastewater treatment facility at the HDD launching site were completed to provide better management of site runoff. Installation of mud treatment system for HDD works at the HDD launching site was also in progress. The system will be used for handling the drilling fluid generated during the drilling process to separate cuttings from drilling fluid. The treated water will be reused in the drilling process while the residual solid materials will be stockpiled and reused in the reclamation stage of the Project. A summary of implementation status of the environmental mitigation measures for the construction phase of the Project during the reporting period is provided in Appendix A. The Marine Travel Routes and Management Plan for High Speed Ferries of SkyPier (the SkyPier Plan) has been submitted to the Advisory Council on the Environment (ACE) for comment and subsequently submitted to and approved by EPD in November 2015 under EP Condition 2.10. The approved SkyPier Plan is available on the dedicated website of the Project. In the SkyPier Plan, AAHK committed to implementing the mitigation measure of requiring high speed ferries (HSFs) of SkyPier travelling between HKIA and Zhuhai / Macau to start diverting the route with an associated speed control across an area (i.e. Speed Control Zone (SCZ)) with high Chinese White Dolphin (CWD) abundance. The route diversion and speed restriction at the SCZ have been implemented since 28 December 2015. Key audit findings for the SkyPier HSFs travelling to/from Zhuhai and Macau against the requirements of the SkyPier Plan during the reporting period are summarized in Table 5.1. The daily movements of all SkyPier HSFs in April 2016 were within the maximum daily cap number. Status of compliance with annual daily average of 99 movements will be further reviewed in the annual EM&A Report. In total, 805 ferry movements between HKIA SkyPier and Zhuhai / Macau were recorded in April 2016 and the data are presented in Appendix G. The time spent for the SkyPier HSFs travelled through the SCZ in April were presented in Figure 5-1. It will take 9.6 minutes to travel through the SCZ when the SkyPier HSFs adopt the maximum allowed speed of 15-knot within the SCZ. Figure 5-1 shows that the SkyPier HSFs spent more than 9.6 minutes to travel through the SCZ and all the SkyPier HSFs had travelled through the SCZ with prevailing speeds ranging from 7.7 to 14.7 knots as shown in Appendix G. Thus, all ferries complied with the speed control requirements within SCZ as specified by the SkyPier Plan. ¡ Case on 1 April 2016: the HSF captain reported that the deviation of routing for a short duration (less than 1 minute) was due to strong tidal current and poor visibility. The prevailing speed was maintained at 13.4 knots. ¡ Cases on 8 and 15 April 2016: both HSF captains reported that they had to give way to other vessels for safety reason and were not able to leave the SCZ through the gate access points. Then the HSF returned to the normal route following the SkyPier Plan. ¡ Case on 19 April 2016: the HSF captain reported that he decided to enter the Marine Prohibited Zone in order to give way to other vessels for safety reason. Then the HSF returned to the normal route following the SkyPier Plan. One exceptional case was reported on 24 April 2016, in which the captain reported that a passenger had left behind a wheelchair on the HSF. The HSF had already departed from the pier and was therefore requested to return to the SkyPier to deliver the wheelchair back to the passenger. The HSF had taken a U-turn in the SCZ and did not go through the gate access points of the SCZ. It also marginally sailed outside the SCZ in part of the way. No speeding was recorded within the SCZ throughout the journey. Four HSF movements attributed to the same ferry with no transmission of AIS data received on 24 April 2016 were reported. After investigation, it was found that missing of AIS data for the concerned ferry was due to conducting AIS system upgrade. Advice has been given to the ferry operator that any future similar incident should be reported to AAHK/ET on the day of ferry trip to facilitate the auditing process. The prevailing speeds of all SkyPier HSFs travelling through the SCZ were all within 15 knots (7.7 to 14.7 knots), which complied with the SkyPier Plan. The time used by HSF to travel through SCZ is presented in Figure 5-1. The current status of submissions under the EP up to the reporting period is presented in Table 5.2. During the reporting period, environmental related licenses and permits required for the construction activities were checked. No non-compliance with environmental statutory requirements was recorded. The environmental licenses and permits which are valid in the reporting month are presented in Appendix E.
During the reporting period, no construction activities related complaints were received. During the reporting period, neither notifications of summons nor prosecution were received. Cumulative statistics on complaints, notifications of summons and status of prosecutions are summarized in Appendix F.
No construction works will be carried out on Sheung Sha Chau Island during the ardeids’ breeding season between April and July in accordance with the Updated EM&A Manual. ¡ Management of chemicals and avoidance of oil spillage on-site. A tentative schedule of the planned environmental monitoring work in the next reporting period is provided in Appendix C.
Baseline monitoring of CWD by vessel surveys, land-based theodolite tracking and passive acoustic monitoring (PAM) are ongoing. The baseline monitoring results will be presented in a separate Baseline Monitoring Report for the marine works. Baseline water quality monitoring has been commenced in April 2016. The baseline monitoring results will be presented in a separate Baseline Monitoring Report for the marine works. The key construction activities of the Project carried out in the reporting month were related to the Contract P560 Aviation Fuel Pipeline Diversion Works which involved mobilization and installation of construction plant, installation of HDD casing pipe, and set up of site office. Dust suppression measures including wheeling washing, watering and covering of excavated materials and establishment of site hoarding have been implemented. Construction dust, noise and waste monitoring were carried out in the reporting period. No breach of the Action or Limit Levels in relation to the air quality, construction noise and waste monitoring were recorded in the reporting month. All site observations made by the ET were recorded in the site inspection checklists and passed to the Contractor together with the recommended follow-up actions. On the implementation of the SkyPier Plan, the daily movements of all SkyPier HSFs in April 2016 were within the maximum daily cap number. A total of 805 HSF movements under SkyPier Plan were recorded and all HSFs had travelled through the SCZ with prevailing speed under 15 knots (7.7 to 14.7 knots) in compliance with the SkyPier Plan. There were 4 cases of not fully following the diverted route and investigation results revealed that all cases were related to safety/emergency situations. One exceptional case was pertaining the HSF had to return to the SkyPier by taking a U-turn without leaving the SCZ through the gate access points and also slightly off the SCZ. In summary, the ET and IEC have audited the HSF movements against the SkyPier Plan and conducted follow up investigation or actions accordingly.